Welcome to the month of November, which leads us into two months of food, food, and more food! After Halloween, I try to cool it a little bit on the sweets and carbohydrates of all sorts (fruit and alcohol included) and try to focus on real food, lots of sleep, and low stress (if any of that is obtainable). I always think eating high amounts of sugar, having higher than normal stress, and not getting enough sleep is a recipe of getting a cold. (No pun intended!) I have no scientific evidence to back up this theory, it’s just my own, but I’ll do anything to avoid getting a cold or the dreaded flu. Each fall I always buy two delicata squashes with the intent of creating a nice stuffing for them. This never happens and I end up cooking them like I do butternut squash (in a shallow pan with a little bit of water), but frankly, I’ve never been impressed. The skins are thin, scraping out the squash is tedious, and the flavor is so-so. Not really worth the effort. But I recently saw this recipe where you roast the squash with the skin on, toss with some butter, onion, and garlic, and just roast. I am all about roasting veggies of all sorts this time of year, but this recipe is exceptional. I’ve already made it twice! 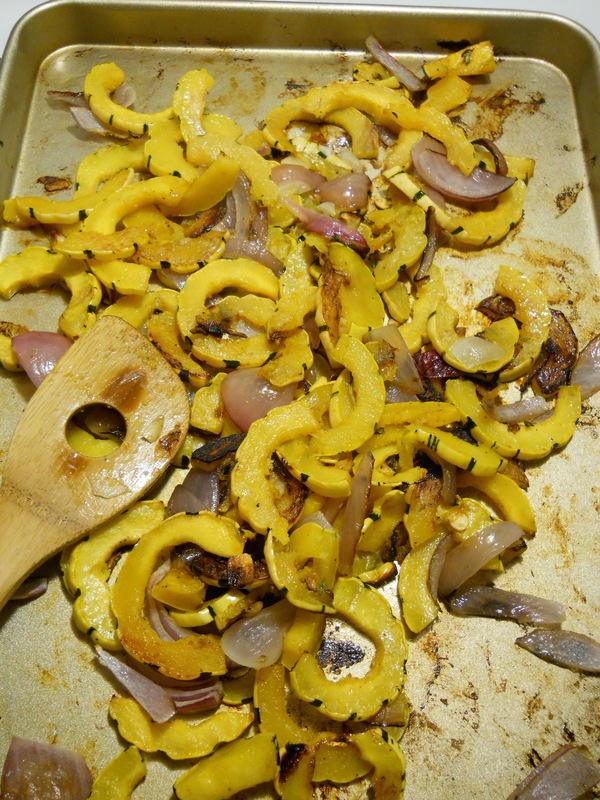 The onion and garlic get sweet with the roasting and the squash gets soft yet crunchy and chewy in some parts. This recipe fit my current requirement for dinner: easy to make, but more importantly, healthy for all eaters and thoroughly delicious! This was great served alongside roasted chicken. Two squashes made for one dinner, and it reheats well for lunch! Originally published in the October 2013 issue of Cooking Light magazine. 1. Place a baking sheet in oven. Preheat oven to 475° (leave pan in oven). 2. Combine first 5 ingre­dients in a large bowl, stirring with a whisk. Add squash and onion; toss gently to coat. Sprinkle vegetable mixture with 1/4 teaspoon salt and 1/4 teaspoon pepper. Carefully remove preheated pan from oven; coat pan with cooking spray. Arrange vegetable mixture in a single layer on pan. Bake at 475° for 20 minutes or until tender, turning once. Sprinkle with remaining 1/4 teaspoon salt, remaining 1/4 teaspoon pepper, and chopped parsley. Cook’s Note: I’ve made this recipe twice, once with honey and once with maple syrup. Both ways are delicious! And while I bought parsley specifically for this recipe, I completely forgot to add it, both times. It’s delicious even if you don’t have it on hand. A very tasty treat indeed. The eater of the house approves.